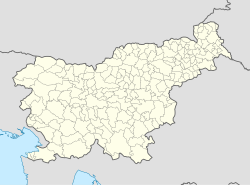 Odranci (pronounced [ɔˈdɾaːntsi]; Hungarian: Adorjánfalva) is a settlement and a municipality in the Prekmurje region of Slovenia. The village of Odranci is the only settlement in the municipality. Odranci is the largest settlement of the Dolinsko region, which lies between the Mura and Ledava rivers. Odranci was attested in written sources in 1322 and 1428 as Adrianch (and as Adryanch in 1389). The name may be derived from *Odьr′anьci, based on the forgotten hydronym *Odьra; if so, the name literally means 'people living along the Odra River'. Another possibility is derivation from *Odr′anьci, based on the Latin name (H)adriānus and meaning 'people living in (H)adrian's settlement'. The parish church in the settlement is dedicated to the Holy Trinity and belongs to the Murska Sobota Diocese. It was completed in 1967 and is an imposing octagonal building with a low dome and a triple belfry. The flag and coat of arms of Odranci were adopted by the Municipal Authorities and published in the Official Journal of the Republic of Slovenia in 1998. The flag is rectangular, with a ratio of 1:2, vertically divided into three equal green, yellow, and red stripes, with the coat of arms set in the middle stripe. There is also a version for vertical hoisting, with the coat of arms rotated. ^ Snoj, Marko. 2009. Etimološki slovar slovenskih zemljepisnih imen. Ljubljana: Modrijan and Založba ZRC, p. 288. This page was last edited on 8 March 2017, at 03:28 (UTC).